Lindsay Henry is a senior counsel in Dykema’s Financial Industry Group. Her experience includes counseling state and national banks, fintech companies and a variety of other financial institutions and financial services providers on regulatory issues and compliance, consumer credit transactions, deposit products, bank mergers and acquisitions, licensing, regulatory applications, technology contracting, payment processing, fair lending and privacy matters, digital banking, mortgage lending and servicing, stored value products and marketplace lending arrangements. Lindsay has advised clients on outsourcing, vendor and client services agreements and developing vendor management programs; treasury management and payment processing arrangements; interest and usury; and the permissibility and structure of new activities and investments. She works with banks and fintech companies to structure marketplace lending relationships, including conducting due diligence reviews; drafting and negotiating loan program agreements, loan purchase and participation agreements, and marketing and servicing agreements; analysis of state licensing requirements; and preparing customer-facing documentation and disclosures. She regularly works with banks and other financial companies to draft and structure consumer loan documentation and disclosures, solutions to specialized mortgage loans and delinquency workouts, and regulatory policies and procedures to direct future compliance. 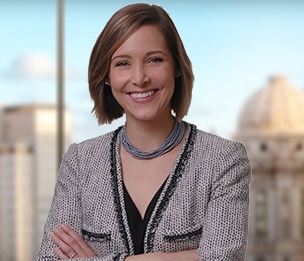 Prior to her legal career, Lindsay worked as a bank examiner at the Federal Reserve Bank of Chicago, analyzing the regulatory compliance of large banking organizations and non-bank subsidiaries. "The Regulation of Marketplace Lending: A Summary of the Principal Issues"
"Southern District of New York Issues Decision on Remand in Madden"
"FDIC Emphasizes Corporate Leadership to Address the Key Risk Management Issues Raised by Cybersecurity and Marketplace Lending"
"Social Media Guide for Financial Institutions"
"OCC Anticipates Nearly Half of Outstanding HELOCs Will Reach End-of-Draw Period by 2017"